The Jaguar XF is all-new for 2009. Based on one of the stiffest bodyshells around, the XF offers excellent handling, a modern, luxurious, and comfortable interior, and a choice of powerful V8 engines driving the rear wheels. 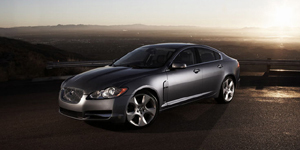 Top-of-the-line models feature a supercharged V8 engine and Jaguar's CATS active suspension. Find the used Jaguar XF of your choice from a dealer in your area. Search our used car listings now.